These used to be a common sight in this area. They were held in big, tin buildings, called “barns”, in cities and towns and attracted a sizable crowd when the auctions were going on in fall. Sometimes they hosted music concerts in the off season. There are some good examples of these tobacco barns in Greeneville. On the back (down the middle): A ‘Natural Finish’ Card Made by Graycraft Card Co., Danville, Va.
Aside: I helped tie and hang tobacco for drying once. This is not recommended if you like to keep your hands clean. Sticky. Brown. Smelled good, though. I used to smoke (a long time ago), so I can say that. 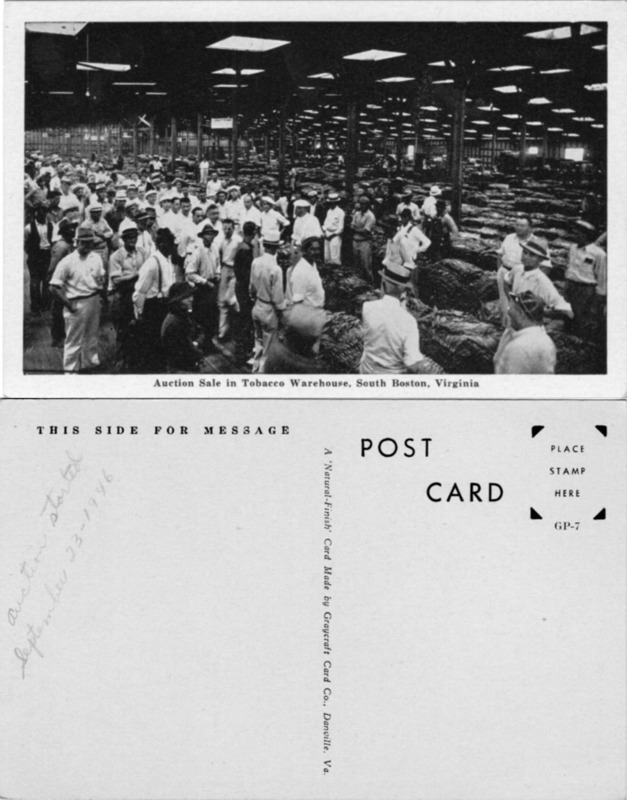 Posted in Existing photo processed by Bob Lawrence and tagged Danville VA, Graycraft Card Co., South Boston VA, tobacco auction, tobacco barn. Bookmark the permalink.